Since Tom arrived into our family, we enjoyed all of our time with him. He is very affectionate and you cannot tell that from his look as he looks like a proper tough Tom cat living on the rough streets of Glasgow and he has the scars to prove that. He loves nothing much then sleep next to you at night and purr super loud. 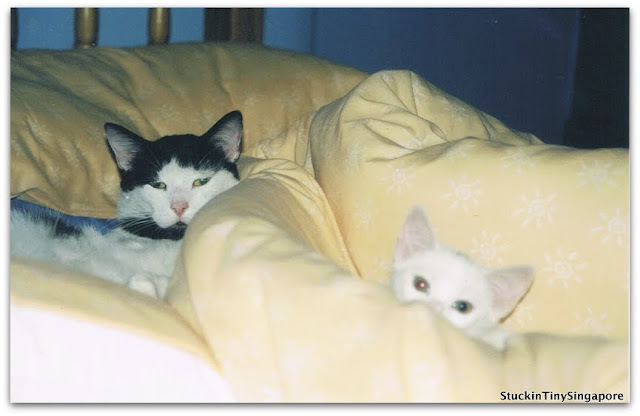 We were living happily together for a year when I took him to the vets for his annual booster shots and that was when the vet asked if I was interested to see some kittens he had from one of his clients. Would I want to see some kittens??? Of course :p. How could anyone turned that proposal down? Lo and behold I came face to face with 3 beautiful kittens, 2 were white and one was a tabby. Then came the one million dollar question, would you like to have one? I said yes so fast you would have thought that someone had given me a million pounds. Anyway, the vet went on to say that another client had been given dips to which kitten she wanted (by the way, she wanted two), so which ever kitten was left, that one would be mine. 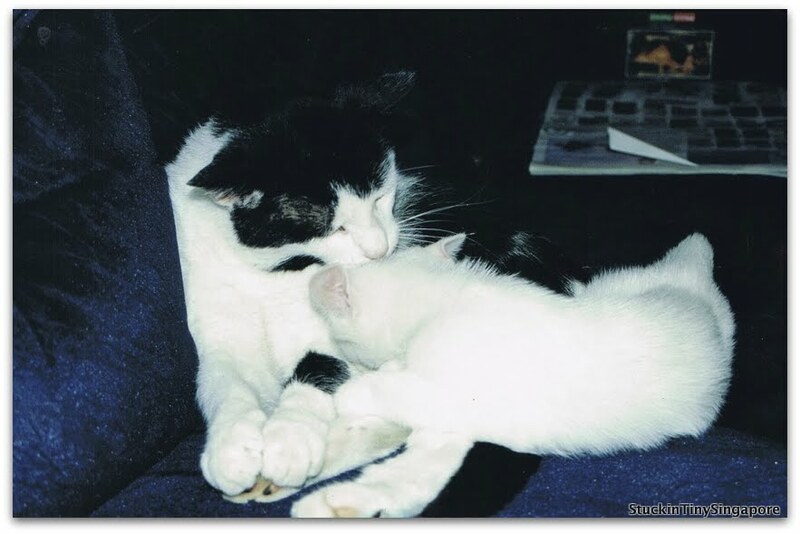 I was too happy to have a kitten so I was not fussy, no one would say no to a kitten. A week later, I was asked to return to the vet's to pick the kitten up. There she was, a pretty little white thing. She was so skinny, scared and super adorable. The amazing thing was when I got home, Tom totally embraced and took in this skinny little kitten as his own. He was like a daddy to her, sometimes pinning her down to groom her. They got along like house on fire. I named her 'Yuki' which is Japanese for snow, since it was obvious she is as white as snow :). Everyone who meets her only asked if she is blind and/or deaf. Apparently a lot of white kittens are, but luck has it, she is neither. 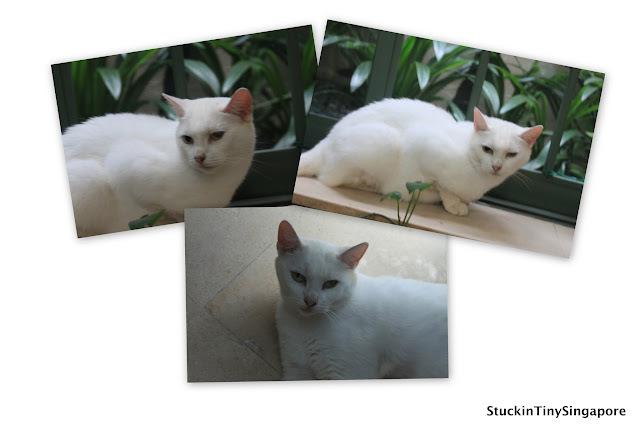 If you noticed from the photos, she has a little black tuft of fur on her head which disappeared as she grew older. Only cute thing is when you take a picture of her with flash, you will see that she has bi-coloured eyes - one red and one green :). 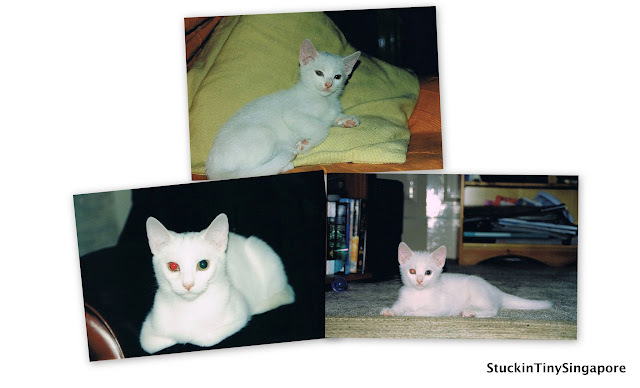 You can read more about bi-coloured eye cats or odd-eyed cats here. Yuki has always been skittish. Whenever we have visitors to our home, you will never get to meet her, as she will be hiding. But she can be very affectionate and loves her cuddles. She has a very regal demeanour and also has the sweetest meow you will ever hear that will melt your heart. She is my husband's favourite as she is what you call a 'proper' cat. She hunts really well and is the sort of cat who will bring home and leave me little gifts. I have found what remained of a black bird, a duckling and countless numbers of voles (both dead and alive). When we moved out of our home in Bury St Edmunds and our tenants moved in, they had field mice from the fields next door coming into the house. While we lived there, we never had problems because we knew that Yuki had been keep watch the house for us and keeping the mice out! Unfortunately, she was involved in an accident when she was 7 yrs old. I came home with the dogs after training and spotted my neighbour and a stranger standing by the road. My neighbour came running and ask if I had a white cat. My heart sank as that was my biggest nightmare. She was lucky, must have chased a mouse across the road and got clipped by a passing car. A nice gentleman came past in his van saw her lying in the middle of the road and checked on her. Luckily for him, if not she would probably be run over a second time. That road outside our house is a straight B-road with loads of trunks cutting through and is also a favourite stretch with loads of motorbikes gunning down the straight. She suffered massive injuries to her left eye. After a period of recuperation, the vet concluded that she had lost sight in that eye. I was just thankful she was alright and alive. The lovely gentleman who saved her even came back later in the day to find out if she was alright. Talk about a good samaritan!! Despite having only sight in one eye, she can still catch her prey and is super alert for any flying, buzzing creatures within two feet of her. 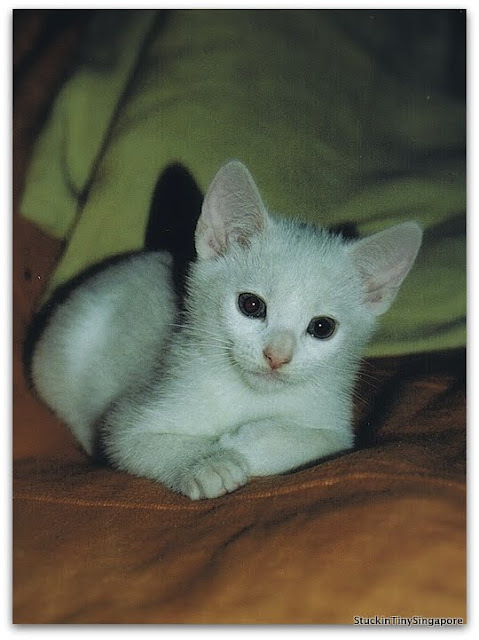 That was back in 2001 when I brought her home, which makes Yuki almost 11 years old. Tom and her have been with me for more than a decade and have moved house with me countless of time. From Glasgow flat, to our Glasgow house, to Stevenage, to Bury St Edmunds, then to Hong Kong and now in Singapore :). Same as Tom, I wish her a long happy life and she has many more years left with me. Recent pictures of Yuki at 11 yrs old.